Over the past 25 years, water conservation and efficiency improvements have provided real water savings, allowing many agencies to maintain or reduce water use while meeting the needs of a growing population and economy. Recent studies indicate that despite the improvements that have already been achieved, significant water conservation potential remains. Indeed, California legislation passed in 2009 requires urban water agencies to reduce per capita water use by 20% by the year 2020. The economics of water conservation and efficiency are key issues. 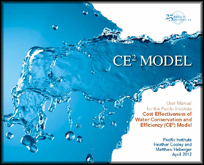 The Pacific Institute has developed the Cost Effectiveness of Water Conservation and Efficiency (CE2) Model to help evaluate the economic desirability of water conservation and efficiency measures and explore how costs and benefits can be shared among customers, water utilities, and other entities (system requirements: PC with Microsoft Excel and Access 2003* or later). The model helps document the costs of starting and running a conservation program and estimate the associated water, energy, and financial savings. It is sufficiently general and flexible to address variations in conservation measures regionally and according to the level of analysis because the model outputs are based on conditions defined by the user. The CE2 Model does not provide “the answer” as to whether a particular measure or suite of measures makes economic sense. Rather, it provides a set of financial metrics that can inform the decision-making process. The CE2 Model can also help water conservation practitioners share information across departments and with other water, wastewater, and energy utilities. The model quickly and easily calculates financial metrics that are meaningful and readily understood by planners and managers. It also provides a common platform through which to discuss the costs and benefits of water conservation and efficiency. This in turn allows utilities to exchange cost experiences and data and learn from one another more easily. The primary audience for the CE2 Model is water utility staff. The model is appropriate for wholesale and retail utilities of all sizes and can be used by agencies that exclusively provide water services, as well as agencies that also provide wastewater and/or energy services. Additionally, it may be of use to consultants, non-governmental organizations, and others interested in water conservation and efficiency and sustainable management of water resources. Download the CE2 Model User Manual.